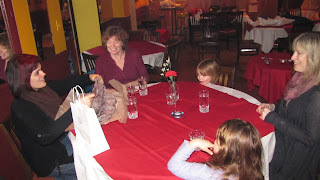 So Anne suddenly arranged that we'd go out with the birthday girls to a restaurant. We haven't been out with the kids to a restaurant for quite a long time. This is partially because some of us aren't really the most restaurant oriented people in the world. (Restaurant oriented?) Restaurants are expensive (compared to groceries). And, of course, because it is usually turns out to be so agonizing, in one way or another, having to deal with the kids in such a setting. We have to try to find something on the menu appropriate, and desirable (both by the kids and by us), which is usually really hard. The kids often don't like the food. They are noisy, and messy. In short, as all parents know, it usually turns out -- no matter how much you think it's going to be fun, and save you from cooking -- to be a rather more stressful experience than anticipated. The last time I remember, I guess wasn't all that long ago... it was in Orillia at Brewery Bay with Selena's mom, last summer. But I can't remember a time before that, so it may have been an anomaly. Also, if there's any place that could be a good restaurant to take kids, it might well be Brewery Bay. It's a casual, family-friendly pub-like sort of place; but most importantly it has some fairly private booths -- so all the whining, noise, mess, melt downs, and "accidents" can be more easily contained. And the menu is fairly diverse and "fun". Still, as I recall, the kids did little but complain, and have to be constantly managed. Emeth refused to to eat pretty much anything, as usual. The kids really don't like experimenting with new food very much, and Emeth especially will barely eat anything besides his familiar standbys: oatmeal porridge, peanut butter sandwiches, pizza with almost nothing on it (though just recently he suddenly decided he likes frozen spinach pizza!? ), and noodles with little to no sauce. It would be quite insane to go out to a restaurant to order noodles with no sauce. Anyhow, Anne really wanted to take my mom to her current favorite little Ethiopian Restaurant. I was worried. But you have to do what you have to do! We'd survive, one way or another. If you're not familiar with Ethiopian dining, it's in some ways as exotic, from the usual Western dining expreience, as you can get. 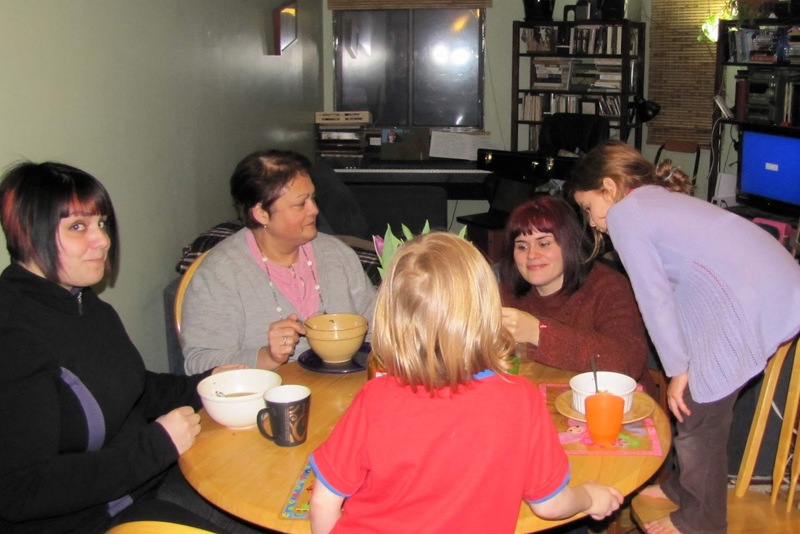 You eat with your hands, often from a shared central plate. Your only "utensil" is a warm, damp cloth used to wipe your fingers when needed. Many of the flavors are unique (and spicy), and it's all mixed (in your mouth) with injera. Injera is a somewhat unique flavour in itself: a sort of sour dough crêpe, or thin bubbly pancake -- made with something called teff flour. 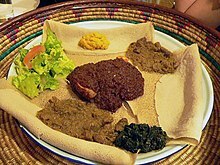 The food (usually a paste, or stew, or fine salad) is served in globs on top of an injera covered plate. To eat, you tear off bits of injera, and use it to pinch up bits of the food blobs. Unfortunately, (perhaps anxious of the ordeal I thought would shortly overtake us with the kids) I completely forgot to take a picture of our dinner... which was quite nice looking in presentation. It was much prettier in its layout than the generic picture above (which I've taken from wikipedia). Much to my amazement, the kids were positively enthusiastic. It turns out that perhaps the problem with most restaurants isn't that the food is too unusual for the kids, but rather that it's not unusual enough! Even the notoriously picky Emeth, hardly whined at all. He, of course, rather limited his selections as to what he'd pinch up, but (incredibly) he generally liked what he had. And he loved the injera, eating a fair bit of it plain. Istra was more adventurous, and tried everything... most of it wasn't too spicy hot, except the lentils. But even when she accidentally once got a mouth full of the spicy lentils she did not entirely freak out. It was amazing. So it turns out, the Ethiopian restaurant (Addis Ababa) was a hit. Everyone loved it, even the kids. And besides having to remind them a few times to use "restaurant voices" (or at least not yell! ), the kiddy-stress was surprisingly minimal. Yay! One final observation: we got to the restaurant fairly early, at around 5:30pm. It seemed like the place was just opening... they still hadn't quite set all the tables. We were the only ones there for the first half-hour or so. This was nice, as it gave us a chance to settle in and the kids to get used to things without worrying about disturbing other patrons. So, along with the visit from Selena's mom and sister a few days before, we've had two pleasant dinners so far this Valentine's birthday season.